The best-selling author of Girl Waits with Gun returns with another adventure featuring the fascinating, feisty, and unforgettable Kopp sisters. After besting (and arresting) a ruthless silk factory owner and his gang of thugs in Girl Waits with Gun, Constance Kopp became one of the nation's first deputy sheriffs. She's proven that she can't be deterred, evaded, or outrun. But when the wiles of a German-speaking con man threaten her position and her hopes for this new life, and endanger the honorable Sheriff Heath, Constance may not be able to make things right. 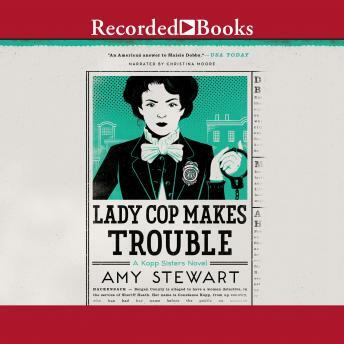 Lady Cop Makes Trouble sets Constance loose on the streets of New York City and New Jersey--tracking down victims, trailing leads, and making friends with girl reporters and lawyers at a hotel for women. Cheering her on, and goading her, are her sisters Norma and Fleurette--that is, when they aren't training pigeons for the war effort or fanning dreams of a life on the stage. Based on a true story, Girl Waits with Gun introduced Constance Kopp and her charming and steadfast sisters to an army of enthusiastic readers. Those readers will be thrilled by this second installment--also ripped from the headlines--in the romping, wildly readable life of a woman forging her own path, tackling crime and nefarious criminals along the way.